My interest in subway mosaics has been re-fired again, as it is every few years. 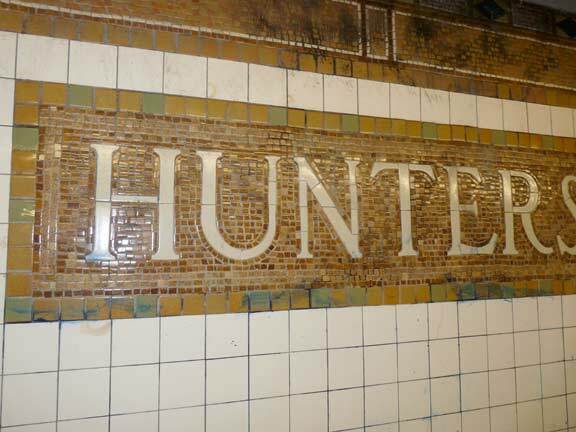 I have a new admiration for the intricate mosaics that were assembled on station walls and signage in the subways between about 1914 and 1928 (after the initial Beaux Arts terra cotta and mosaics done in original IRT stations from 1904-1914. Station appointments and signage from 1908 to the 1930s were developed by architect/artist Squire J. Vickers, who adjusted his approach over time from the florid Beaux-Arts period through a more mundane period in which subway tiling was more direct and informational, through the even more streamlined Moderne stations built for the Independent Subway from 1932-1948. 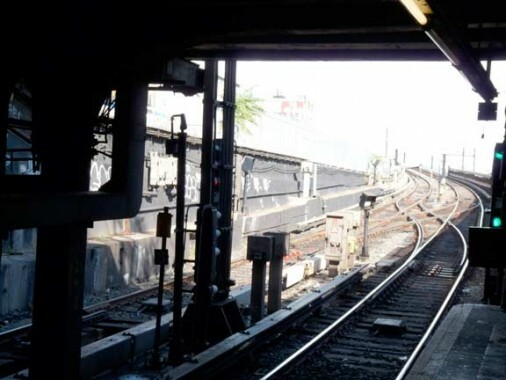 Two underground stations in western Queens (Vernon-Jackson and Hunter’s Point), belonging to the IRT Flushing Line, have acquired more importance in recent years as the surrounding area becomes more built-up. A third station, Court Square, is the site of a recent major transfer construction as the #7 train was united with the IND G, E and M stations. Both Vernon-Jackson and Hunter’s Point, however, have remained almost unchanged in aspect since 1916, when the stations opened. Most original mosaic tiling is still in place and most exit/entrances are still open. Both stations can be considered living history. Earth tones dominate the Hunter’s Point signplates. The interior is small tiles of brown of varying shades. There’s a thin exterior border, mostly dark brown, but with lightr tiles shown in. And the outside border is light brown and khaki, perhaps some :hunter” green as well. The serif letters — used on both BMT and IRT signs from the era — are mosaicized as well but in different pieces. Very occasionally Vickers would abbreviate a station name on signs by initials especially if the station name was two words. This approach has also been done at the 138th (Mott Haven) station in the Bronx. The signplate colors are repeated here, and also on mosaic strips at the ceiling line. Blue diamonds are interspersed at even intervals along the top. This motif is also repeated, as well as the H.P.’s, on platform pillars. Note that here, periods punctuate the abbreviation, whereas the ones at MH (Mott Haven) don’t. This mosaic sign, at the entrance staircase, seems to have been removed or tiled over since I photographed it in 1999. At Queensborough Plaza, this line divides into branches going to Astoria (a BMT line) and originally, Corona (an IRT line). 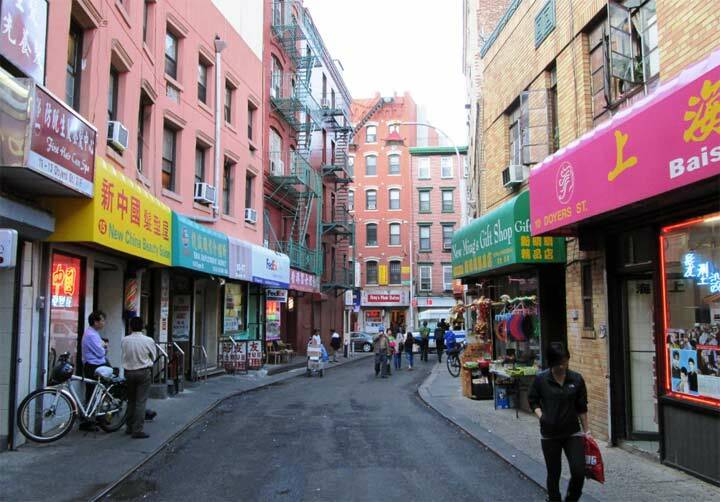 In addition, the #7 runs in tunnels originally developed for streetcars in the 1880s by piano magnate William Steinway, who built an entire light rail transit system in Queens in addition to his piano works and workers’ housing in northern Astoria. When the Corona Line (as it was called then) opened to Queens in 1914, the Hunters Point station was the original loop track back to Manhattan. No trace remains as the station was built on top of it. Of all the stations in the NYC subway system this is probably the one closest to the tunnel entrance/exit ramp to an elevated line, though East 149th in the Bronx and Carroll Street in Cobble Hill come close, too. In Brooklyn, the Wilson Avenue station in Bushwick was built along the Cemetery of the Most Holy Trinity and is stacked on two levels, with the southbound elevated and the northbound in a tunnel. Ships/delivers from Long Island City! Yes I remember this one well. What always stood out as you mentioned was how close to the tunnel entrance the platform was- really nice on a good weather day! I wonder how long it would take to photograph and document the entire system. 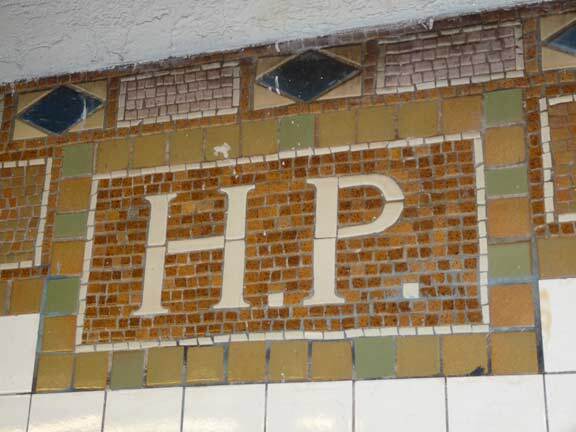 i bet some of the young uns out there will think that HP means hewlett packard…..
As an artist in Long Island City for many years, I’ve painted the nabe and the Vernon-Jackson subway mosaics were a subject awhile back. http://sjfnewyork.blogspot.com/2008/12/vernon-jackson.html. 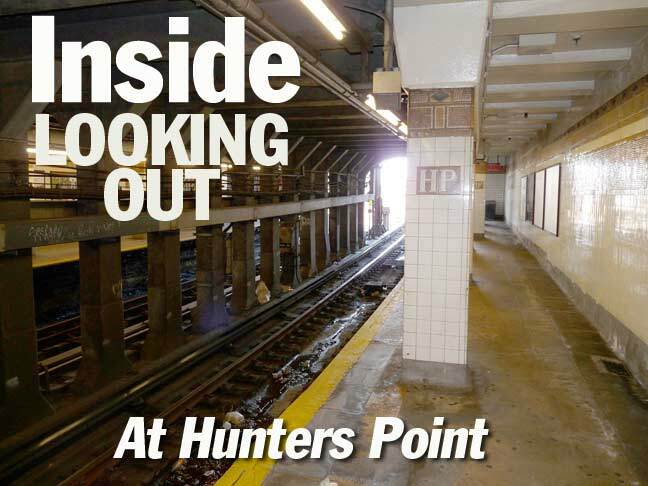 I’ve heard the Hunters-Point station will be going through a face-lift as the area has changed very much with new development. 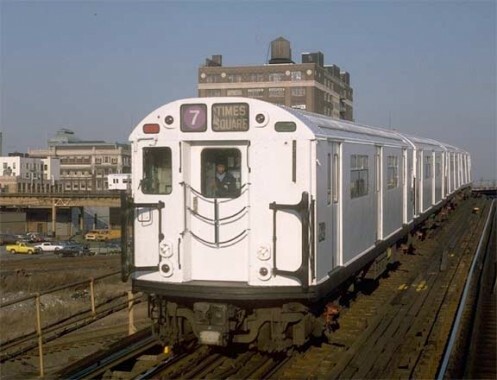 I did not know that IRT,and BMT,conetced at Queensboro Plaza,until I got the book,Transit Maps of the World,By Mark Oveden.I will plan to visit the station again,and try to find the sign that says:TO.ASTORIA CORONA,this weekend. Thank You for making this story. 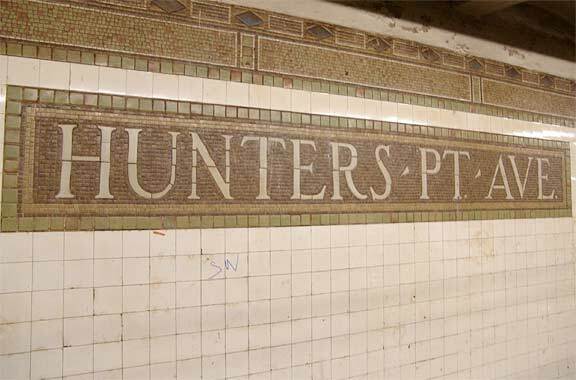 It doesn’t seem to be at the Hunters Point station anymore, I believe it got tiled over. 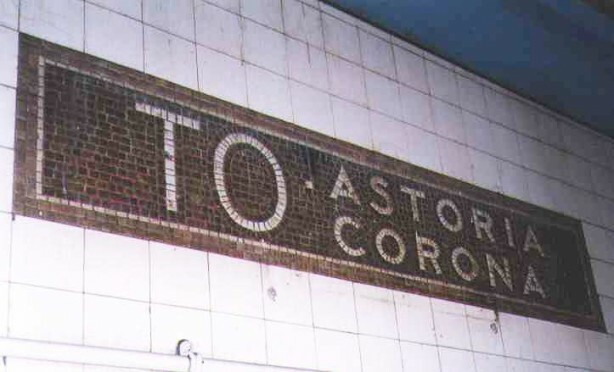 FYI – the recent HP station renovations have revealed the “TO: Astoria Corona” Sign located midway up the stairs to the Queens-bound platform side. May be partially covered by construction partitions.- who knows if it will be preserved when the work is complete.